As one of the nation’s leading environmental education and research institutions, The State University of New York’s College of Environmental Science and Forestry (SUNY ESF) has experienced substantial growth over the past decade. In response, SUNY ESF, in conjunction with the State University Construction Fund, commissioned the design and construction of a new, LEED Platinum Gateway Center. 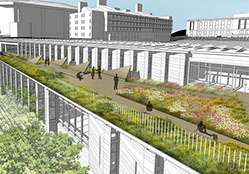 In an effort to exploit the limited site footprint and maximize available campus open space, the project team incorporated a fully-accessible, 9,400-square-foot, intensive green roof, which stretches along the entire western façade of the building. 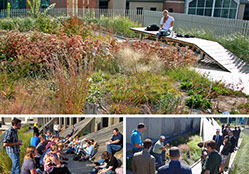 Through collaboration with the faculty, students, and the design team, the landscape architect crafted a comprehensive vision for the green roof with the goals of providing a flexible space to accommodate both large events and intimate classes, reducing stormwater impacts on the surrounding landscape, providing a habitat island to benefit adjacent open space, and augmenting the existing curriculum by introducing novel plant communities and species for ongoing research. Traditional details such as dune fences are reimagined to create a secure edge without impeding views or the user’s sense of enclosure. Thoughtful coordination with the design team allowed for the seamless integration with roof monitors, which provide natural daylighting to the concourse below. The project goals were achieved through an integrative design process that resulted in a continuity of materials and form that reinforced two rare plant communities, possessing one of the highest concentrations of protected New York State plant species. 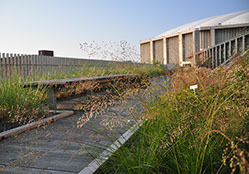 Virtually every aspect of the green roof is influenced by the contents and context of the Alvar and Lake Ontario Dune plant communities. Plant species richness and diversity are among the highest of any natural community in the eastern U.S. Prior to construction, Andropogon and the SUNY ESF faculty executed an ambitious regime of testing plots and field studies to ensure the success of the unproven set of plant species. Testing protocols were created to examine various plant growth criteria ranging from soil media chemistry, depth, fertilization, and irrigation. Testing frames were designed and constructed to replicate the exact materials and conditions being proposed on the final green roof installation. 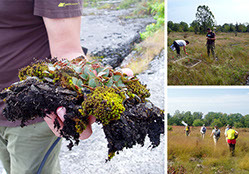 Research and site visits to the native communities were conducted to study typical vegetation patterns and soil conditions. 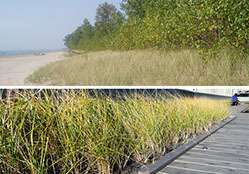 Beyond plant associations, Andropogon developed specialized details to reinforce the narrative and validity of the Alvar and Great Lakes Dune plant communities. In particular, the strategic use of Geo-foam allowed the designers to recreate some of the aesthetic and functional landscape characteristics that define these analog communities. 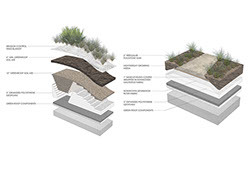 Randomized soil pockets that resemble geologic Alvar formations, known as grikes, create subtle depth variations to help dictate where niche species develop on the green roof. The central circulation spine acts as an organizing framework for the planting, and takes on a form and materiality that strengthens the aesthetic associated with these diverse communities. Its scale swells from north to south with each ‘knuckle’ denoting a slightly larger room, providing imbedded flexibility for different user groups and events. The inherent light weight properties of this foam also permitted the use of thin limestone slabs which mimic the open expanses that are a distinctive feature of Alvar community. 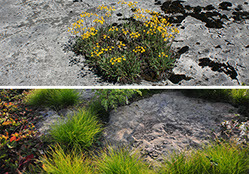 Plant species establishing within the fissures form elegant patterns of color and texture that produce a dramatic contrast against the surrounding stone. 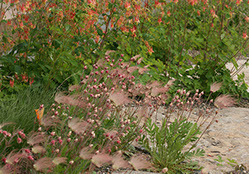 Along the roof perimeter, undulating berms whimsically interlace with the dune fence and provide subtle microclimates for plant species uniquely-adapted to the windswept conditions. 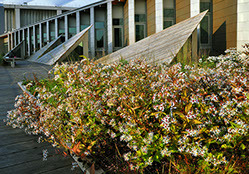 The Gateway Center green roof serves multiple functions for SUNY ESF, providing the well-known benefits of intensive green roofs for reducing stormwater runoff and heat island effects, while showcasing the school’s mission to promote leadership in the stewardship of both the natural and designed environments. 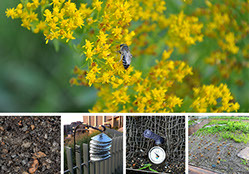 In addition, the SUNY ESF green roof is also an outdoor classroom and laboratory allowing faculty and students to have unique access to rare, native plant communities and to study how design can impact our environment. 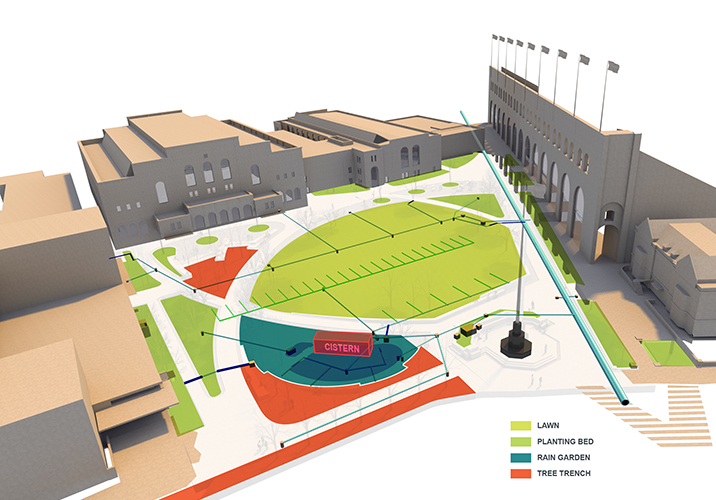 The roof is being actively integrated into courses for the Landscape Architecture, Ecological Resource Engineering, and Environmental & Forest Biology departments. 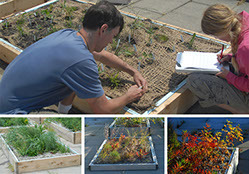 Native plant species unique to New York, which are found in the Alvar Pavement and Lake Ontario Dune communities, were tested at the SUNY College of Environmental Science and Forestry for their feasibility on a campus green roof and their contribution to ecosystem services in comparison to the naturally occurring communities.